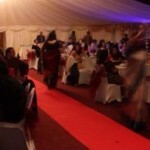 A glittering charity fundraiser was organised by the Slough based ‘Royal Berkshire Bengali Association ‘in aid of SHOC and Save the children on April 5th 2014, amidst the sprawling greens of the Slough Hockey Club. It was a very enjoyable evening with a Bollywood themed dinner and dance , full of music, fun and delicious food and an attractive raffle booty was also up for grabs. Their efforts have raised a sum of £1573 which has been split between the two charities. Sincere thanks from all at SHOC, the money will help us continue our work with clients and this kind of support from the community is a terrific moral boost for our staff.